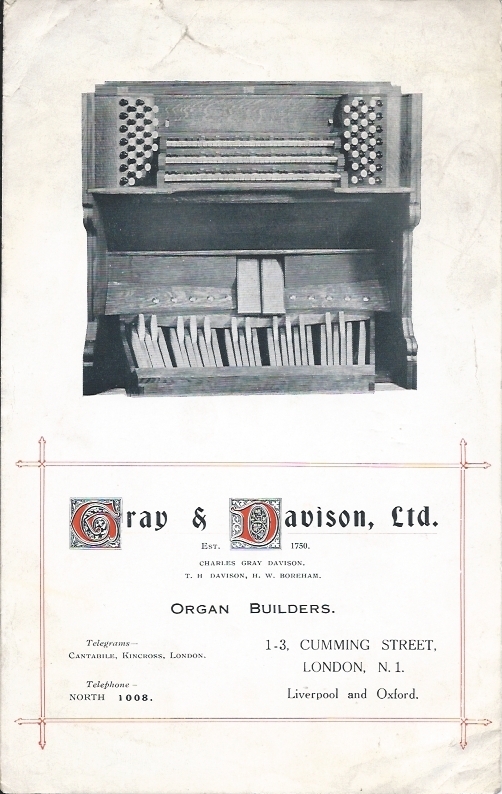 The Crystal Palace Foundation purchased this collection of over 150 photographic images and ephemera of Gray & Davison Co. Ltd organs in 2014. The collection was contained in a small leather wallet. The company exhibited at the Great Exhibition 1851 in Class 10a Philosophical (Instruments and Processes depending upon their use; Musical, Horological and Surgical Instruments) and were awarded a Council Medal 'For their invention in Organ Building, of a new method of connecting the Great Organ with the Swell Organ, by means of a Pedal, and of a new Stop, called the Keraulophon'. They also had a full-size organ in the building located above the United States of America Court. The background to the collection is not known but there are several indications that it may have been used by the company as examples of organs made by them to generate more work. The images seem to date from the late 19th to the early 20th century. Many identified examples of their organs are shown (both extinct and extant) including those at Workington; Shrewsbury; Walworth; East Sheen; Tottenham; Wood Green; Clapham; Hartlepool; Hanwell Park; St. Brides, Fleet Street; St. Lawrence Jewry; Warrington; Neston; Holborn Town Hall; Leeds; Edmonton; Camberwell; Manor Park; Oxford; Herne Bay; Musselburgh; Swansea; Lille and many others as yet unidentified. Also in the archive are some collected examples of advertisements, organ recital programes and ephemera relating to the company's participation in the Great Exhibition. The company was wound up on 30th April 1975.